The detail on this miniature Mercedes G500 is extraordinary. Based on the gargantuan G63 6x6, the Mercedes-Benz G500 4x4 Squared is one of the most extreme off-roaders on the market, but with an asking price of well over $200,000 it’s out of the reach for most buyers. Happily, there is now an alternative for buyers with a smaller budget that’s a lot easier to store. That’s because it’s a detailed 1:18 scale model created by GTSpirit, and while it may be significantly smaller than the real thing, the attention to detail is just as extraordinary resulting in an eerily accurate replica. Mercedes-Benz supplied GTSpirit with the original design data used during the development of the Mercedes-Benz G500 4x4, allowing GTSpirit to replicate the real car with painstaking accuracy in its 1:18 scale form. 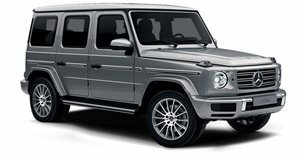 GTSpirit’s miniature Mercedes G-Class will be available in a choice of eight unique colors: Diamond White, Electric Beam, Tektite Grey, Mauritius Blue, Sunset Beam, Alien Green, Tomato Red, and Galactic Beam. In a nod to the SUV’s W463 internal codename, only 463 examples of each color will be produced. Every model will also be individually numbered. Despite its diminutive size, the 1:18 scale G500 contains up to 100 parts as well as “a number of special equipment” parts. No word on pricing yet, but Mercedes says you can either dealerships to secure an order or visit GTSpirit’s online shop. If reports are to believed, the current Mercedes G-Class has a limited shelf life as the German manufacturer will be unveiling an all-new model at next year’s Detroit Auto Show in January.